Renewing your US passport is something you should only have to deal with every ten years, but for many international travelers, it becomes necessary to do it more frequently than that. Holding a second passport, filling up your first with stamps and visas from frequent travel… any number of factors can contribute to needing an early renewal. As such, it’s essential to check on your travel documents prior to a big trip. If you do need a new passport book, it wouldn’t hurt to familiarize yourself with the application form. Applications to renew passports aren’t all unlike. Even some travelers who have held passports as a child or lost their current ones may consider this process a renewal, but in the eyes of the US Department of State, you may as well be applying for the first time. In order to qualify for a passport renewal, your current US passport must have been issued in the last 15 years, undamaged enough that it would still be accepted at immigration, and not be a children’s passport valid for five years. All those needing to renew passports meeting these criteria can use DS-82 from the US Department of State. 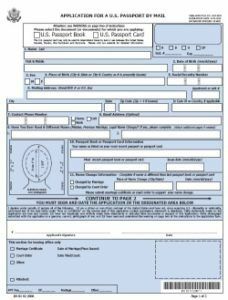 Form DS-82 is fairly straightforward as a passport renewal application form: six pages long, four of which are instructions and two which must be mailed or handed in. Standard information like your name and address are required, but any applicant who has legally changed his or her name for any reason should provide documentation stating as such so this information can be amended on the new passport. In addition, you should have your previous passport number and expiration date handy, along with any travel plans if you want to expedite your application. Where can I submit my passport renewal application? Along with supplying your most recent passport and Form DS-82, you’re required to submit a passport-sized photo taken within the last few months and a fee for $110. If you need to expedite your application or submit it in person to a regional passport office, there will be additional fees: $25 for an execution fee, and $60 to expedite. Once you have all your paperwork gathered and ready to submit, you need to consider the time before your next international departure. Travelers who have several weeks or months before they need to do business abroad can reasonably expect to have their passport returned with a mail-in application; this requires them to send all the aforementioned documents and payment directly to the National Passport Processing Center in a specified PO Box depending on where you live. However, those who have a matter of days prior to their flight might consider submitting their passport renewal application in person at one of the 26 official regional passport offices around the country. Providing proof of departure and a reason to expedite the application is essential, but still doesn’t guarantee you’ll receive your new passport book on time. All US embassy and consulates are equipped to handle renewals as part of their passport services, but not all will process applications by mail if you’re simply passing through the country and don’t have a foreign mailing address. In this case, you can choose to apply in person (recommended), wait until you return home, or ship your documents back to a National Passport Processing Center in the US; the latter method is not advisable due to the processing time. Travel Visa Pro’s staff members have over forty years’ experience demystifying the visa and passport application process for our clients. If you’re looking for a service that provides a speedy turnaround with the kind of customer service that will make you confident when handing over your travel documents, come and see us at one of our nine staffed offices across the US, or one of our dozens of pickup and drop off locations in major cities. At Travel Visa Pro, we understand that preparing for travel can be a particularly stressful time. Rather than shouldering this burden yourself, why not let travel professionals work on some of that cumbersome paperwork? Why take time away from work, packing, and making plans to relax abroad when TVP can walk you through what you need to do for Form DS-82? We’ll do the heavy lifting and get you a renewed passport book in the time you need.